Dr. Gene Palka is a 1973 graduate of Beaver Falls High School. He subsequently earned a B.S. from the U.S. Military Academy at West Point, an M.A. from Ohio University, and a Ph.D. from the University of North Carolina at Chapel Hill. He served in the U.S. Army for more than 33 years as a commissioned officer. While in high school he served as the co-captain of Coach Larry Bruno’s 1972 MAC co-champion football team and also co-captained the 1973 section champion baseball team. He was selected as an all- conference all-star in both football and baseball and received the conference outstanding pitcher award. He was an American Legion baseball all-star playing on the teams that were coached by his father, which won county, district and regional championships. During his senior year he was also the MVP in the Beaver County CYO basketball League as he led his team to the county championship. After graduating high school, he chose to attend the U.S. Military Academy at West Point, where he competed in both football and baseball, and graduated with a commission as a lieutenant in the Infantry in 1978. Upon returning to USMA as an instructor, he served as an Officer Representative for the nationally-ranked Army Wrestling Team, which won the Eastern Intercollegiate Wrestling Title in 1987. He concurrently worked with the Army Football Team, and in 2006 became the Head Officer Representative for the Army Football Team. In 2009, he deployed to Iraq in support of the Commander of a Division of Operation Iraqi Freedom. 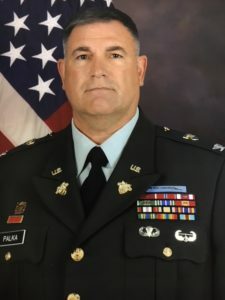 A veteran of both the Afghanistan and Iraq wars, Colonel Palka was the recipient of numerous military awards throughout his career, including the Legion of Merit and the Bronze Star. An accomplished professor, researcher, and author, Gene has served as a research colleague and distinguished lecturer for several Intelligence agencies. Dr. Palka currently serves as the Vice President for Student Success at Eastern Kentucky University. He and his wife, Cindy, are the parents of a son and a daughter.